Who are you, how did you get here, and what would your life be like if you hadn't been adopted into this family? 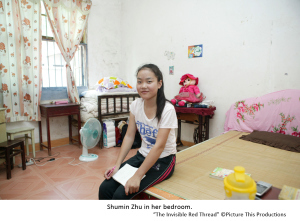 The Invisible Red Thread follows 15-year-old Vivian as she tries to answer these questions. Vivian’s family openly discusses her story and supports her desire to learn more about her roots. The family has some roots to China: her older sister, Hillary, was adopted from China two years before Vivian, and her father Hubert has Chinese ancestry. Identity and control (two of the “Seven Core Issues in Adoption” as identified by Silverstein and Roszia) feature prominently in this documentary. Vivian’s desire to learn her roots shows a desire for identity. She deals with the lack of control in her early life by wondering what her life would have been like had she been adopted by a Chinese family. By the end of the film, Vivian has found answers to both questions. The issues touched on by the documentary expand its scope beyond international adoption to all adoption. Many parts of The Invisible Red Thread were exemplary. Vivian’s parents obviously love her, and are grateful for having her in their life. When people tell them, “your child is lucky,” they respond that they know for sure that they are very lucky to have her. I appreciate how openly Vivian’s parents provide her with her own story. They don’t know her birthparents’ identities, but they share whatever they have. They’re not threatened by her desire to go to China, and in fact wisely explain, “adoption means different things to [children] at different points in their life, and you always have to tell the adoption story over and over… There’s more and different things they get out of it every time.” They know that adolescence is “a great time of questioning and identity seeking,” and commit to helping Vivian in her search. The documentary explains a cause of the need for adoptions from Chin by providing a brief overview of China’s “one child per family” policy. The relationship between Vivian, who was adopted into a Canadian family, and Shumin, who was adopted into a Chinese family, is a powerful one. As Vivian returns home, she explains that she doesn’t have to ask “what if” anymore, because she knows. 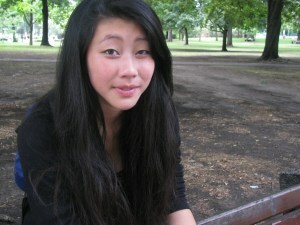 She expresses an understanding of her identity that reflects her Chinese heritage and her Canadian family, “Some people say you’re only family if you’re blood-related. I don’t really believe that… There’s always going to be a little space for China, and [because of the trip,] the space grew.” Although some of her questions remain unanswered, she explains that, through the trip, she “filled in the blank spaces” in her life and “figured out more of who I am as a person.” Vivian explains that she can now “move on to other things.” Her parents’ wisdom comes to mind – that adoption means different things at different points in life. It’s quite possible that Vivian will want to return to China again in the future. Shumin’s description of adoption is powerful and honest, “My parents go through a lot to take care of me. I should really be thankful to them. I should study hard at school and not disappoint them.” Shumin’s family adds, “an adopted child might take better care of us when we’re old.” Shumin’s parents obviously love her; her mother becomes tearful while explaining the teasing Shumin endures. However, the differences in cultural expectations of parent/child relationships may make the scene a bit difficult for some Western audiences. Some prospective adoptive parents in the West express expectations that adoptees should be grateful, and Shumin’s position could be contrived as supporting their expectations. However, most people connected to adoption accept that adoptees shouldn’t be expected to view their adoption as a debt to be repaid. Shumin struggles with some aspects of being adopted. She learned only recently that she was adopted, when her grandmother told her. Shumin explained that she was shocked and sad, and wondered why she was abandoned. She added, “If my birthparents looked for me, I wouldn’t acknowledge them because they abandoned me. It wouldn’t be right to live with them.” We are introduced to Shumin’s parents, who explain, “When I gave her away, I didn’t feel good… If we had too many kids, they would have destroyed our home.” Some viewers might struggle with Shumin’s feeling of abandonment, and some prospective adopters who desire a very closed relationship might be tempted to use Shumin’s words as proof of the importance of having no contact. In a stirring scene, a woman comes to see whether Vivian is her daughter, but learns that she is not. She explains, “I was hoping that she was my child… Seeing her do fine would make me feel better… I hope my girl ended up in a good family, and if not, [I hope that she comes] looking for us, and I would be happy too.” This scene may be uncomfortable for some adoptees because Vivian does not meet her birth mother, and this woman is left without meeting her daughter. Vivian is able to see that Shumin’s parents care about her, but expresses it in terms of how nice Shumin’s room is. This might resonate with some Western teens, who sometimes associate “love” with belongings and gifts. The Invisible Red Thread isn’t widely available. It is easy to set up a screening, or to purchase a copy from the film company’s website, but it’s not available on Amazon or Netflix. 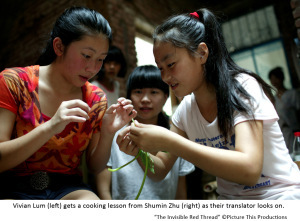 The Invisible Red Thread seems best suited to four audiences. Families who’ve adopted internationally could watch this with the pre-teen and teenage children as a way to introduce the possibility of a trip to their home country. Families considering international adoption could use this film to learn about the importance of culture and to become more sensitive to the potential desires of their future children. Adoption agencies could use this short documentary as part of their training curriculum for prospective parents. Families who adopted domestically also should acknowledge the importance of adoptive and birthfamily history and culture in their child’s life, and could use this film to introduce the idea of searching for answers. What does adoption mean in your child’s culture, and how is it received? Vivian found value in visiting her homeland, even though she did not reunify with her biological relatives. What value might your child receive from visiting his or her home country? If you’re adopting internationally – does your child’s home country consider children adopted from the country to still be part of that culture? What strengths do you see in Vivian’s family? In Shumin’s? What questions were answered for Vivian by her journey? Which were left unanswered? How will her sense of identity and control be impacted by the journey and the answers she found? Like this article? Think about following me on Twitter, and liking Adoption at the Movies on Facebook!